At first light, Linnaea wakes up and looks out over the tiny town below. From her front windows on the hillside, she can see the plumes of smoke rising from the chimneys in the valley, and the tall peaks of the San Juan Mountains looming above in the background. She brews a pot of hot coffee and puts it into a picnic basket alongside a few locally-made breakfast pastries. Then she pulls on her wool hat and snow boots and carries it down the small hill into town, across the snow-covered streets to my doorstep. Eventually, I will get up and collect the basket. But here and now, seeing the snowy peaks outside the window, I’m paralyzed by the charm of my cabin. It took seven years to build, and as I lay in bed looking around the room, it’s not so hard to believe. 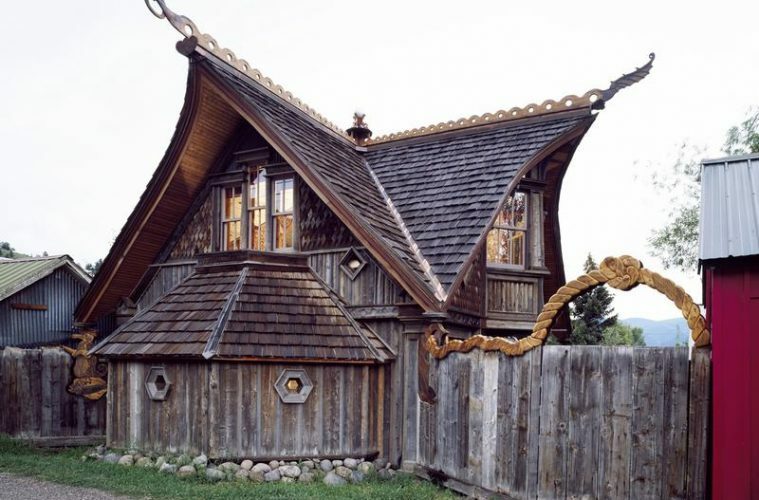 The architecture combines that of a Norwegian stave church with a Chinese imperial palace, integrating an eight-sided roof, three-styles of lattice work (Norwegian, Celtic, Maori), and truckloads of repurposed Colorado timber into its design. It’s one of those places where a large collection of small, intricate details dominates the décor, leading you on an Easter egg hunt of discovery as you settle into the room and notice that a sword-wielding soldier is carved into the toilet seat, or that the cabinet handle has been whittled into a hammer. Which I find interesting, considering the setting outside is anything but complex. The town of Creede in southwest Colorado has an area of just over half a square mile (.6 miles2), with a permanent population of about 300. It’s the definition of simple beauty – a small, tight valley with a river running through it, the tall peaks beckoning above. The town itself is an old silver-mining camp, where in a given day you are guaranteed to see more wood piles than vehicles, and where skis that would be locked down in the city are left leaning against the fence outside. 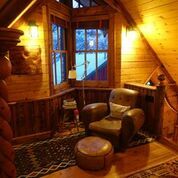 To pick out this cabin, with its fire-breathing dragons decorating the rooftop, from the rural, country homes that surround it is as easy as picking a zebra from a team of horses. The very first thing I remember upon finding this cabin online is being confused about its name: The Boathouse. Why would this architectural masterpiece, built in the middle of the mountains with European and Asian influences, be called a boathouse? The inviting and eclectic interior of the Boathouse accommodations at Windsock Acres. Walking through the door, I had my answer. On the ground floor, below the main living quarters, sits a hand-made wooden boat. The family rows it on the river in the summer. That marine theme serves as an undertone as you follow the “rope” railing up the stairs, look out the porthole-style windows at the mountains, and see by the light of the row-boat lantern that hangs from the ceiling. Formerly of a city lifestyle in Denver, Linnaea moved to Creede to help her family open the Boathouse. She manages it, along with two adjacent cabins, the Cajun and the Magnolia – collectively known as Windsock Acres – like an extension of her home, delivering coffee in the morning, providing recommendations in town, and mapping out cross-country skiing or hiking routes. She hopes to offer guided tours of the backcountry and even sell her own game meat, like local elk steaks, for guests to grill. For Linnaea, it was the perfect example of why she moved here from Denver last year, and of the type of Creede kindness she hopes to pass on to her guests. For me, a traveler from the big city, it was a smaller-than-a-small-town moment, a utopian twinkle where the grocery store gal remembers not only your name but that you prefer paper to plastic.